Andy North, Ben Wood, Mick Bowden, Mike Senior and Dave Edwards will complete the 850 miles consisting of six marathons and over 600 cycling miles in under seven days thus creating a new world record. Each day we will be running a marathon distance of 26.2 miles followed by a further 100 miles cycling, a total of 15 hours on the move. This is a unique venture and we invite both members of the public and supporting businesses to take part in the challenge. We also welcome anyone to join the endeavour at any stage of the route either by bike, on foot, by skateboard, or even by tandem. Each entrant will be able to drop in and out of the challenge at any stage of the event and in doing so they will be able to help and inspire the Ultra6 team to create the World Record. The World Record challenge has the full support & leadership of Andy Reid who was a Corporal with the 3rd Battalion The Yorkshire Regiment, whilst on patrol in Afghanistan, Andy stood on a pressure plate IED and as a result of the explosion, he lost both his legs one below and one above the knee and his right arm. After only 2 weeks Andy astounded people with his recovery and positive attitude. The Soldiers’ charity fully supported Andy by providing floor lifts and ramps throughout his house to ensure he had full access at all times. I was very honoured this week to be awarded the Yorkshire Young Entrepreneur of the Year Award, presented by Prince Andrew. Whilst I have never been in business to win awards or receive accolades, to receive recognition of this prestigious award was a genuine honour. I’m not so good at blowing my own trumpet, so here are some words about the event and why AcclimatiseMe won. A recent University postgraduate has received a prestigious award from the Duke of York in recognition of his entrepreneurial skills. 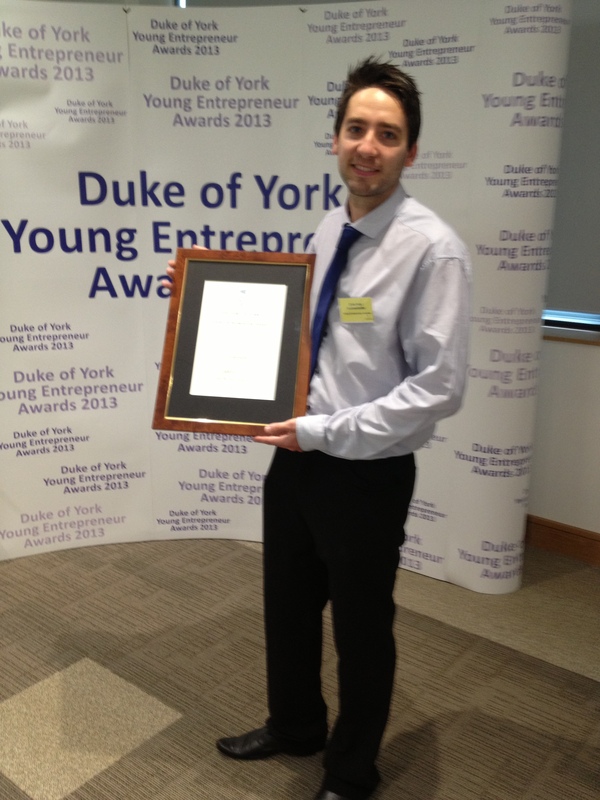 Chris Hale, who founded AcclimatiseMe, an innovative altitude business whilst studying for an MA in Business Management, was a winner in the first ever Duke of York Entrepreneur Awards which were held on Tuesday 21 May. The Awards acknowledged Yorkshire and the Humber’s finest student and graduate entrepreneurs and Chris was one of ten winners who represented each of the region’s universities. Yorkshire was specifically chosen for the launch of the Duke of York Young Entrepreneur Awards due to the strength of its local partnerships, as well as the region’s success in developing business start-up services and funding. ​Chris founded AcclimatiseMe whilst completing his MA in Business Management at Leeds Trinity University. The young entrepreneur has introduced cutting edge altitude training technology from New Zealand to the British market, which helps climbers to prepare for their summits, thrill seekers to conquer Kilimanjaro and elite sports professionals to improve their performance and speed up their rehab process. AcclimatiseMe continues to attract critical acclaim, with Chris currently in the running for a Shell LiveWIRE Grand Ideas Awards. Thanks for reading, onwards and upwards for AcclimatiseMe! This January 17th-20th we are exhibiting at the prestigious Outdoors Show at the Excel in London.The Outdoors Show is the UK’s Number 1 show for outdoor enthusiasts and in 2012 attracted over 85,000 visitors. Whether you’re interested in walking, hiking, climbing, mountaineering, camping, photography, canoeing, cycling, mountain biking, sailing or anything else outdoorsy – you’re sure to find plenty of interest and have a great day at the show. This years theme is 60 years on Everest and will give visitors an insight into the history, both past and present of the great mountain.The exhibition will feature amazing photography documenting key expeditions as well as a display of clothing, and a selection of special artefacts. Come and see us, as we are offering an exclusive 20% off courses if you sign up at the show, whilst offering a free chance to try our altitude training from the comfort of our reclining leather chair. We are on stand OU130. Happy New Year from the AcclimatiseMe team! We are going to start the year with a fantastic competition, with the prize being a pair of tickets to The Outdoor Show at the Excel in London January 17-20th. So, to win this great prize all you have to do is email the most exciting adventure you are embarking on in 2013 and what it means to you to achieve it! Email all responses to Chris@acclimatiseme.com by Friday 11th January and we will decide the winner next Saturday! Good luck, we can’t wait to hear from you!